Leo was born on 1971 in Edmonton, Alberta. 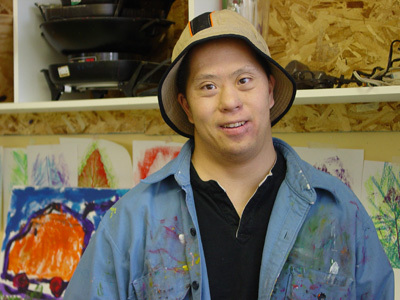 Leo enjoys expressing his creativity through painting and drawing. A world traveler, he likes to make pictures about experiences in his life and the places he has been. Leo has a very strong imagination and creates stimulating visual compositions. An important part of his paintings are the titles he uses to describe them. Combining many different media, including tempera and acrylic paint, chalk and oil pastels, crayons and markers, Leo’s work reveals a sophisticated and complex mind. Leo is also a musician; he plays the violin and sings in the Brail Tone Choir. Leo’s work has appeared in several juried exhibits and was accepted to the Alberta Foundation for the Arts Traveling Exhibition Program administered by the Edmonton Art Gallery.